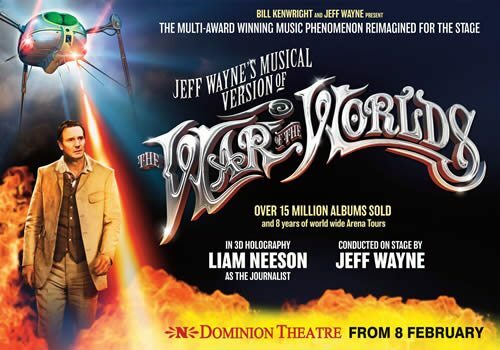 Jeff Wayne’s ground-breaking musical version of The War of the Worlds comes to the West End and makes its London debut at the Dominion Theatre. Following performances of Elf the Musical, the musical phenomenon that is The War of the Worlds opens on February 8th 2016. Originally released as a 1978 concept album which sold over 15 million copies worldwide, the show was reimagined in 2012 before embarking on an extensive live tour. Wayne’s progressive rock compositions have received huge critical acclaim, winning two UK Ivor Novello Awards as well as the US Best Recording in Science Fiction and Fantasy. Now, The War of the Worlds is brought to life in a spectacular theatrical event which is produced by Bill Kenwright and directed by Bob Tomson. Adapted by Doreen Wayne and based on H.G. Wells’ celebrated 1898 science fiction novel of the same name, The War of the Worlds depicts a destructive alien invasion that spreads across the country. A journalist roams an abandoned London in search of his girlfriend, attempting to avoid the cruel and terrifying Martians who are determined to conquer the human race with their superior weaponry. Considered to be both shocking and exhilarating when it was first published, the theatrical adaptation promises to be equally as thrilling. Jimmy Nail (Auf Wiedersehen, Pet) makes his West End debut as Parson Nathaniel and is joined by Daniel Bedingfield and Sugababes singer Heidi Range, who make their own West End debuts as The Artilleryman and Beth. Further cast members include Michael Praed (Dynasty) as George Herbert, Madalena Alberto (Evita) as Carrie and David Essex as The Voice of Humanity. Liam Neeson makes a screen appearance as The Journalist. Jeff Wayne will provide new music for this production, with lyrics in collaboration with Gary Osborne and Paul Vigrass. Music will be performed live onstage, conducted by Wayne. The War of the Worlds previews from February 8th and opens officially on February 17th 2016. The breath-taking production will play a limited season until April 9th 2016 and promises to wow audiences.